Regarding the temperate climate, with broadleaf trees changing color seasonally, there is a charisma in the air, an inspiration, a profound unveiling of the inner self where breathing the cooler air and seeing the astonishing colors of the leaves reminds me of my genuine reflection. I am not at peace. Yet, this season brings a quiet in my heart I have waited for since last year. Autumn is a journey of exploration, and all the realms entirely within myself. Nature is on the move. When it first arrives, it is as if it is an accident – that stunningly chilly morning. Refreshing, on the other hand unnerving and disturbing, almost as if something is wrong. Turns out it is good jacket weather, and time to eat some apples, and anything with them in it. If you read my Apple Season cocktail from last year, I made a similar cocktail, again inspired by apples. The first difference with this one is with the rum, using three rums instead a single rum and Applejack combination. Not that all daiquiris require Cuban style rums, I wanted that flavor attention. The Bajan rum spices the Matusalem, not as a spiced rum would, but in the same way salt enhances the richness in a dessert. And the dark Coruba adds a lovely brown sugar flavor, rather than molasses. Instead of just lime juice, I wanted to incorporate more flavor from the oils from the lime peal in the muddling, as well as the unique blending with the sweetness of the lemon peal. Then, the amounts of cider and cider syrup** are increased to make a larger and sweeter drink. I also wanted to change the bitters, feeling Regan’s orange bitters would give a better impression than the savory Angostura, particularly with both lemon and lime. My first apple cocktail was a more refined drink, and needed double-straining, floating a delicately thin slice of apple to float. 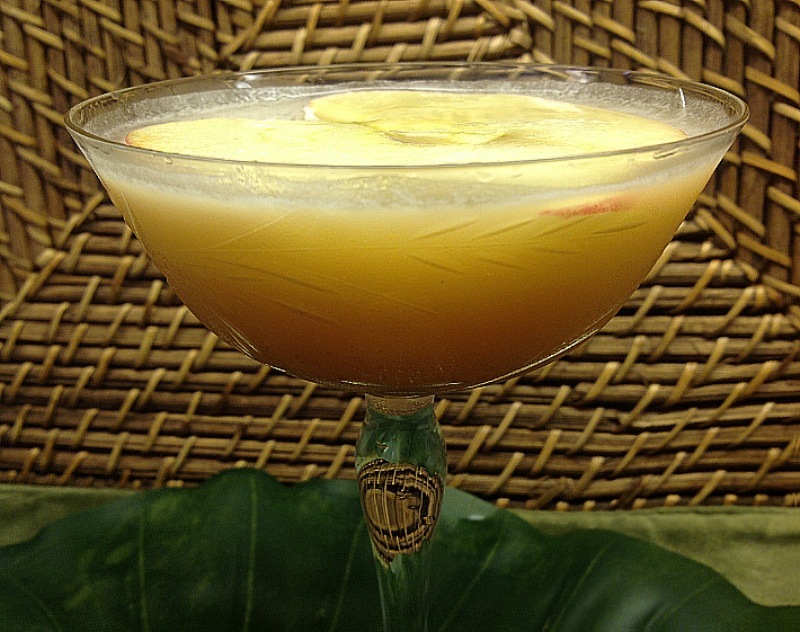 The Autumn Daiquiri is a bit more playful, not only with flavors, but the unstrained salad-effect. Muddle lemon, lime, apple, syrup & bitters. Add rest & shake hard with ice. Pour unstrained into chilled old-fashioned glass (or collins glass). Garnish with a hearty apple wedge. Simmer just below boil for few minutes to reduce slightly, stirring regularly. Take off heat and let stand until room temp. This will taste better the next day, but ready to eat right now with your pancakes…or aebleskivers…or Swedish coffee bread. It’s Apple Season! It’s Apple Season! Ahhhh-Hoooo!! First let me explain something, I like apples, but really don’t take to them on a regular basis, nor do I crave apple pie, or apple dumplings, or anything flavored for the sake of apples. I don’t have anything against them, just like I don’t favor them. My point is, for the most part I rarely eat apples and any thing made with them pretty rarely…at least until autumn hits. Autumn changes me, alters me, sends me into biological dynamo of teenaged hormone-driven rambunctiousness. Not only is it football season, there simply is something in the air, an electrically charged mood, an altered perception, as if my blood has chemically imbalanced. I understand this all sounds ridiculous. I also understand it doesn’t last long. Autumn feels like the briefest of seasons, most likely due to my having so much fun. While this season surprises me upon its arrival as much as its departure, Apple Season particularly takes hold of me as a Venus Flytrap around its prey. There is no escape. It has already happened. I can’t get enough apple, whatever form the fruit can provide, whether as juiced into a cider, baked into a pie, thickened as a butter, picked off a tree and eaten it out of my hand, or in this case – mixing a little of all for this cocktail. I need to give credit where credit is due: An extraordinary orchard and a cooking website have influenced my wife and I. We have driven 3 hours down to a fantastic orchard for a number of years, and have been surprised not only by how popular it always seems to be, meaning busy, but how well they thrive as a business. So many assortments of apple products, so many kinds of apples, and by what we’ve experienced – everything tastes delicious, and well worth the drive. We’ll leave with a couple bags of apples, a couple gallons of cider, a few caramel-covered apples (with nuts), a couple jars of apple butter, sometimes an apple pie, sometimes a cup each of apple slush, yet always open to suggestion or experimentation. The orchard is called, The Apple Works, which is south of Trafalgar and north of Sweetwater Lake, but also found at http://www.apple-works.com. If you go in the fall, make sure to head a bit farther south to Nashville and get their fried biscuits and apple butter (one of the things that makes the town almost as famous as the Nashville in Tennessee). Last year, my wife found an outstanding recipe for pumpkin waffles at allrecipes.com. After eating this profound breakfast, my thoughts immediately went to how I could use the cider syrup for cocktails, since I hear about all kinds of syrups used in that way. My first thought of course turned to rum. When I first made it, I used Appleton, thinking it well-suited for an incredibly sweet apple cider made sweeter as a syrup. But this time I wanted to use a demerara rum, thinking of its richness distinctive to that of the Jamaican rum, not necessarily better, since both are unique perspectives in enjoying rum. One of my favorite demerara rums is El Dorado 12 year (I have heard the 15 year is the best, but have yet to try it). The next ingredient is Applejack, not Calvados. I have nothing against the french brandy, yet believe it is too refined for a recipe with so many ingredients. Applejack is sweeter, and a little friendlier for this. I like Laird’s applejack, especially its American history. If any of you are in the mood, check out the Interesting Facts link at www.lairdandcompany.com. Now that the spirits are taken care of, the only thing to do now is load up on the apple flavor. I considered apple butter as one of the ingredients, but not for this one, maybe later. I figured muddling would thicken the drink enough after straining, where apple butter would only add more cloud to the bottom of the glass. Using cider, fresh juice from the fruit, and an apple syrup, I felt enough characteristics of the apple were properly introduced. I questioned whether to use lemon juice over lime, though in the end went with my fondness of combining rum and lime. Tasting them is like listening to two best friends having a funny conversation. You can’t help but smile. I am also encouraged to infuse rum with apples to offer even more flavor, perhaps sooner than later. For an extensive list of infused recipes, please check out boozedandinfused.com where you’ll learn how easy it is to make your own splendidly fresh tasting spirits and liqueurs. 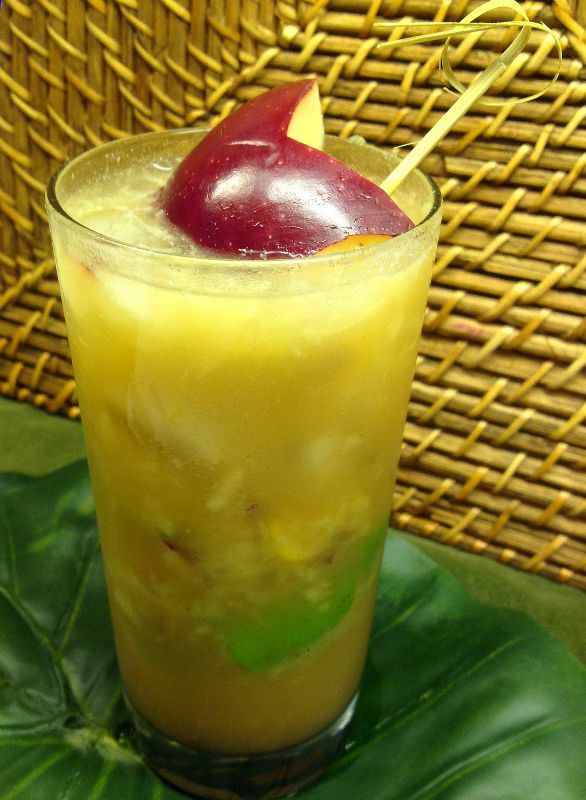 Muddle apple with syrup and lime juice. Double-strain into small, pre-chilled cocktail glass, garnish with floating apple slice. Muddling is important here, crushing the apple into a puree, and getting every drop out of the fruit. I have two muddlers, one with a flat bottom, and another with teeth. A flat bottom muddler will do the best work here, and more thoroughly. The toothed one will get a better start, but it’s the best finish we’re after. Make sure you have a sure grip on your mixing glass due to all the effort and pressure forced down into the glass. I’d get pretty sore with myself if all that fell on the floor, namely that precious cider syrup. Also, double straining is important in this drink, that is if your do not want food in your drink. I like unstrained cocktails in many cases, thinking it simply tastes better with the demolished ice and broken fruit from shaking, however not in every situation. This cocktail needs a little refinement, an endeavor worth the trouble when you taste it. And if you’re not familiar, double-straining is using an additional fine mesh strainer, that is straining the drink with a hawthorn strainer (or for those of you who prefer julep strainers), and pouring through a fine-meshed strainer. It confirms no shards of ice, or sediment from the muddle apple. Mix sugar, cornstarch, and cinnamon in a pan. Stir in cider and lemon juice. Cook over medium heat until starting to boil; boil until it thickens. Remove from heat and stir in 2 tablespoons of butter until melted. Serve warm. Again, you can find this recipe at the allrecipes.com. website. I am probably going to drink this until Apple Season runs out of my system. And then it’s Pumpkin Season…I can’t wait.